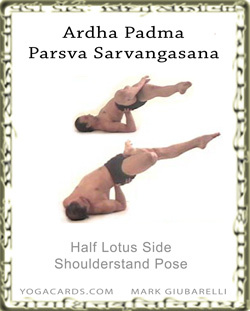 In the Shoulderstand pose bend one leg and enter Half Lotus with the leg. Then place the hand on the hip and lean over to that side. Point the toes, heel or ball points of the toes in the extended leg. Use the other arm to support the pose or stretch it out to help maintain balance. In this pose you can do half lotus with either leg. It is a little nicer to do the version with the leg extended in the side of the body being stretched more. You can see both versions opposite.